The American archeologist R.B. 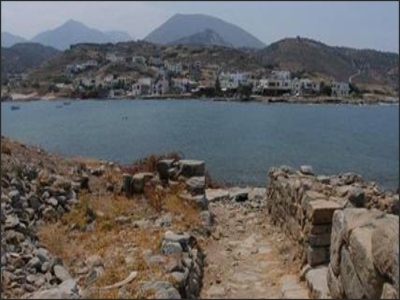 Seager discovered the archaeological site of Mohlos in 1907, after following the instructions of a local fisherman. The following year, the excavations began on the little island, which revealed 20 built tombs and about 12 habitations. In 1955, J. Leatham and S. Hood cinducted underwater searches and found Roman fish tanks at the coast across the island, supporting the hypothesis that the island of Mohos was a peninsula during the copper age. According to the findings of the excavations, the island of Mohlos developed to one of the most important centers of the Minoan civilization. 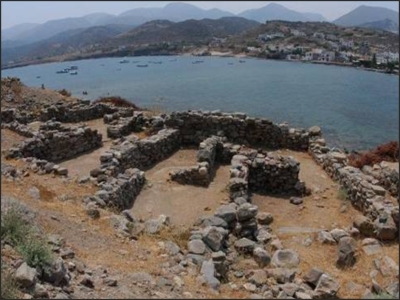 The valley ashore provided a rich agricultural production and the narrow strait that united the island with the shore in antiquity was forming two natural ports, keeping the ships safe in any weather condition. As an important commercial center, it imported obsidian from the island of Milos and other raw material from the East, which were further supplying other regions of Crete. The discovery of a circular stamp that comes from north Syria and dates back to the 18th century, proves the significance of this port. In the 'district of the craftsmen" golden jewelry was constructed, along with stamp-stones, and the famous stone vessels of Mohlos, many of which were found in tombs of the period. After the destruction from the volcano eruption, the town of Mohlos was reconstructed and expanded. The new town had central roads and other smaller roads that divided the town in districts. The houses were built in different levels, adjusted to the inclination of the ground, and had two or three floors. 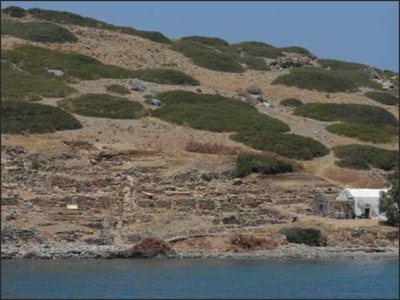 During the last phase of the extended habitation on the island of Mohlos, a 1st century fortification is constructed at its north and east part. The fortification was probably an effort of Ierapytna to establish its presence on the north coast of Crete in this period.